Dallas-headquartered American Airlines has climbed on the bandwagon and become the last of the three major U.S. carriers to offer members of its frequent flyer program the option of using their accrued miles to directly book flights in the premium economy sections of many flights. The change was announced to AAdvantage Mileage Plan members in a Jan. 31 email. Prior to Jan. 24, members of American's (NASDAQ:AAL) AAdvantage Mileage program could only choose from Main Cabin, Business or First Class passage. Airline rules did not allow passengers who booked a standard economy seat using miles to upgrade to its Main Cabin Extra seats. While the carrier may have been later to the party than United Airlines (NYSE:UAL) and Delta Air Lines (NYSE:DAL), the miles required seem to be the most reasonable of the three. 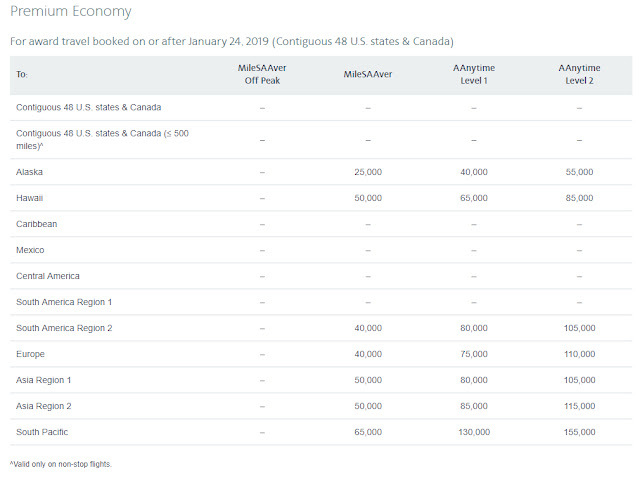 For example, the table posted on American's website shows that a MileSAAver ticket from the 48 contiguous United States to Europe in the main cabin will cost 30,000 miles each way, while a MileSAAver ticket in Main Cabin Extra seats will cost 40,000 miles in each direction, or 80,000 miles for round-trip passage. Passengers who want or need more flexibility or are traveling on shorter notice may have to purchase AAnytime tickets, which come at a higher price. AAnytime tickets to and from Europe, which come in two levels, can cost either 47,500 or 65,000 miles each way for Main Cabin tickets, 75,000 or 110,000 miles for Main Cabin Extra seats, and 110,000 or 130,000 miles for Business/First. By comparison, Delta’s fare for a round-trip from Seattle-Tacoma International Airport (SEA) to Amsterdam Schiphol Airport (AMS), departing May 5 and returning May 11 will cost SkyMiles customers 175,000 miles (plus a modest service fee) for that airline’s Comfort+ premium economy seating. Meanwhile, for a flight on United from SEA to London’s Heathrow Airport (LHR) leaving and returning on the same dates, a MileagePlus member would have to shell out 240,000 miles for a seat in that airline's Premium Economy section. Both the Delta and United fares were returned by their respective websites, which TheTravelPro queried on Jan. 31. As most experienced travelers know, prices – whether in dollars or miles – are subject to change. Finally, it appears that American’s website may not reflect the new offerings. Attempting to find Main Cabin Extra fares using miles returned no results, either when inputting specific destinations or when using the carrier’s handy Award Map, so the carrier may have some catching up to do. In the meantime, travelers who plan to use miles and would like to book Main Cabin Extra seats would do well to call AAdvantage Customer Service directly at 800-882-8880. As a long-time AAdvantage member, I’m excited about the change. While premium economy seats don’t approach the level of Business Class seats, they’re certainly a cut above Main Cabin seats, providing a much-needed “middle ground.” Further, because they don’t carry the premium of Business Class seats, it will enable passengers to travel more comfortably for a modestly higher price. Consider this: A couple traveling to Europe would have to use 230,000 miles for Business Class passage but only 160,000 miles for premium economy. Granted, one is not the other, but the 70,000 mile savings will almost leave enough miles for another round-trip, premium economy ticket to Europe if purchased on the same basis. More points left in the account means more travel in the future. That's what I call a "win-win"!